Born in Northampton England. Father professional jazz saxophonist, mother professional jazz singer, started playing piano at age 4. Always preferred to improvise and make up own tunes then, and now! 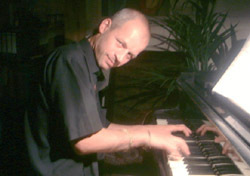 Some published music available here http://www.ilike.com/artist/emerging/AndyLeeRobinson, feedback welcome. Rachmaninoff Piano Concerto No. 3 (121k) Rachmaninoff Piano Concerto No. 3 - One of the most demanding piano works ever! Chopandy (9k) Composed in 1991. Reminiscent of Chopin? Let me know! All Midis (129k) All of the above zipped. I recently ran across your MIDI of Rhapsody in Blue. I must say, I was astonished to find someone who put in the time to accomplish such a feat. It appears to be very accurate. I picked up the MIDI file of your arrangement of Gershwin's "Rhapsody in Blue" over the weekend from Gerd's MIDI homepage. When played back on our "Audiotrix Pro" (see http://www.mediatrix.com) the piano really sounds great. You did a great job in reproducing the work. This is the most impressive piece of step-entry i have ever seen. How ever did you do it? This superb production deserves to be in a separate category from most of what is available on the net. I was really amazed by this fantastic piece of music-arrangement you produced! Don't know how it came to my HD, but it's really great! (Perhaps you could send me some other overwhelming products of your soundcard? All your compositions are great. Specially 'Glad to be Blue'. This one is the coolest of all. Great job, pal. This is the best version I have ever heard. The nuance of both the clarinet slurs and the grace notes on the piano track were incredible. I would love to hear a full orchestral version of this piece. Thanks for the post.